Jeff Davis' record cuff offers a fashionable, new spin on classic LPs. A little bit Earth-friendly, a little bit rock n' roll, this unique cuff bracelet is all style. Made by designer Jeff Davis, the record cuff is the result of smart design combined with his commitment to give new life to cast-off albums. 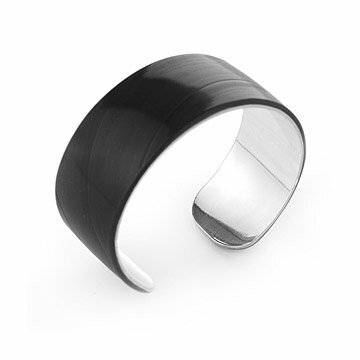 Rescued from landfills, yesterday's top 40 hits are recycled into this sleek vinyl and rhodium-plated brass bracelet. An unusual gift for music aficionados and vinyl collectors, the cuff lets your favorite rocker know you think she's solid gold. Handmade in Philadelphia. This is a very unique pieces of jewelry that I think my sister will really enjoy. She loves 80s music and records were still popular than. However it is very small compared to normal bracelets, but it looks like they can become flexible as directed by the instructions. It is also very delicate given the fact that it is a record that has no kind of sealant over top of it. Had to expand it to get it on/off but then had to squeeze it back for it to stay on and it cracked right away. Would have it replaced if I could but not sure a new one would be any different. It also scratches easily but that is easily fixed with a sharpie. Cool idea though. This is always a fun conversation piece. Most wouldn't know it's a "record" at first glance but when told what it is, I get a surprised & intrigued reaction. Good fit. Only con is that it scratches fairly easily. I use a black sharpie to fill in the scratch mark. I wear it often. Fits my wrist like a glove. Great conversation piece. As a collector of vinyl I thought this would be a perfect early b-day gift to myself and I love it! It's fun, comfy on my wrist, jazzes up my outfits and my musician son, who also collects vinyl, thinks it's pretty cool too! A winner all around! I adore this bracelet!! It's unique, it's comfy and it fits nicely! Jeff Davis is so talented and I've been pleased to find some very fun items of his creation for my music-loving son - but, this is for me! Purchased as a gift and recipient was thrilled! I bought for my 17 year old niece. She loves music and is into records. Thought this would be perfect for her. She told me she loved it and that her friends did too. She thought it was very cool and liked that you could see the lines from the record in the cuff. This is one of my new favorite things. It looks great on my wrist. The record lines are subtle but I don't mind - while the recycled material is a cool feature, it was really the look of the piece that drew me to it. I love cuff bracelets generally but since I have very small wrists (less than 6" around) it is difficult to find ones that fit me. I was encouraged by some previous reviews that this one would work. When I first took it out of the package, it was much too big, and I was prepared to be disappointed. But following the instructions I heated it in very hot water and was able to gradually bend it so that it fits me perfectly. It holds its shape very well, I have worn it a few times and there's no need to adjust it again.